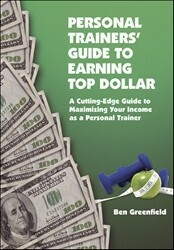 Recognizing that multiple income streams are key to success in the fitness business, the Personal Trainers – Guide to Earning Top Dollar identifies those streams and provides instruction on how to command your income. Greenfield examines face-to-face personal training; physician referral systems; online training; Web 2.0 technology marketing; outsourcing to local and overseas merchants; dietary supplement industry; nutritional consulting; book, audio, and DVD sales; corporate and home training; public appearances and marketing. Each chapter makes learning how to train for top dollar as convenient as possible, by providing necessary step-by-step instructions, forms, templates, phone numbers, websites, real life examples, and insider tips and tricks. Ben Greenfield is recognized as one of the top fitness, triathlon, nutrition, and metabolism experts in the nation. In 2008, he was voted as the Personal Trainer of the Year by the National Strength and Conditioning Association, an internationally recognized and respected certifying agency. Ben is director of sports performance and oversees the physiology and biomechanics laboratory at Champions Sports Medicine in Spokane, WA, which offers metabolic-based weight loss, bicycle fitting, running gait analysis, swim stroke analysis, VO2 max testing, blood lactate testing, resting metabolic-rate analysis, and other cutting-edge procedures for weight loss and performance.